I confess. I am going to be doing some Christmas cheating. 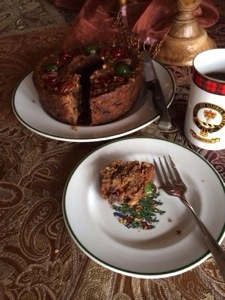 My mother-in-law sent me this fruitcake, and I appreciate it, bless her heart. I may be strange, but I happen to like fruitcake. Diet? No it’s not on my diet. There is absolutely nothing healthy about it. It’s Christmas, that’s all that needs to be said. When I was a child my mother baked all kinds of candies for Christmas. Fudge, divinity, caramels, peanut brittle, on and on. No wonder I have such a sweet tooth. She would make these chewy caramels, put them in a tin and hide them somewhere in the house, weeks before Christmas. My brothers and I would try to locate the hiding place and eat some. It was a delicate task to make it look as if no one had been in the tin. If she found out, she would move the tin. When I was in high school we raised money for the band by selling Texas Fruitcakes. That was my introduction to fruitcakes. Nuts, sugar, candied fruit- yes it’s super sweet, just like me. I think my blood may be made of maple syrup. My hair is looking like it’s been sprinkled with confectioner’s sugar. OK, I think I’m getting a little carried away. I think I’ll go grab me some M&M’s. All kidding aside. It is Christmas. So what am I thinking about? Not Christmas presents. It is not our top priority. Instead, we are looking at other things we can do to share the meaning of this season. I’ve been doing some digital painting lately, so I decided to make a Christmas card. I will post it in the newsletter. It will show the manger scene, but differently. All of my life I have pictured the shepherds’s fields being on a hill overlooking Bethlehem. Most pictures show it that way. When I visited Bethlehem last year, I saw it was reverse. The fields are low in a valley. Bethlehem is on the hill. So for my picture, imagine an angel hovering over the shepherds down in the valley, while you look from the top of the hill in Bethlehem. That is how I painted it. Remember, though, it was night. The colors are muted. Oh, and I don’t think it was in winter either. The winter solstice idea came from a later church tradition. Here’s what I want to convey: There was something that happened in Bethlehem that required angels get the attention of some local shepherds. What was happening was so paramount, God required an audience. He who was born would pay for the salvation of all people. It was God’s unique solution to our sin problem. God was going to pay for it by coming to the earth in a Son, Jesus. He did it because He loves us. He would pay it, because only His divine Spirit in Jesus could overcome the judgment so we could be forgiven. God planned it long ago, but it began that night. It is the greatest love story ever known. Don’t let this Christmas pass without pausing to consider who Jesus is and the eternal life He offers. It is more important than presents and sweeter than fruitcake. I too enjoy fruitcake but I have to tell you, Glenn, super sweet like you? I think you forgot about the nuts. Super nutty maybe? I look forward to the picture. Isn’t it strange that with time how the truth gets skewed just enough to be believeable that it will take us off course?